I seem to have cultivated a mild addiction recently to buying vintage teacups. Not a bad thing but I only normally drink tea by the half pint! 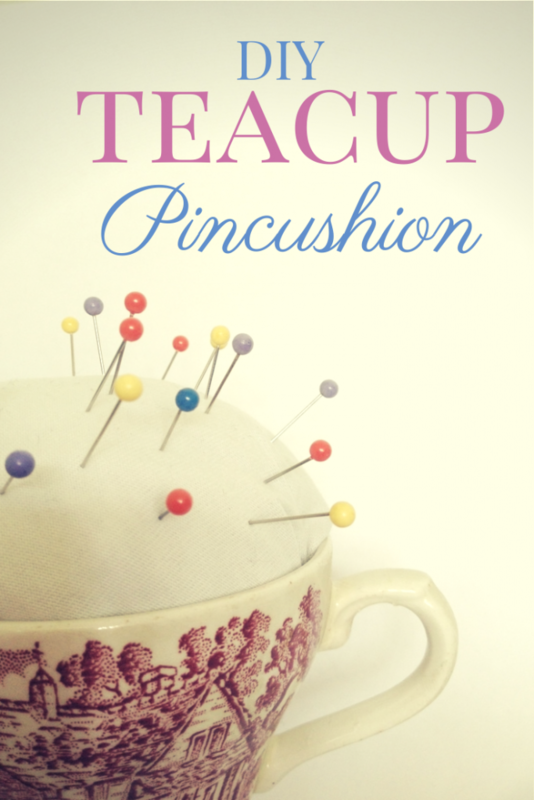 As a result I’ve rather got myself into trying some DIY teacup craft ideas and a friend suggested that it might be fun to try and make a pincushion with one so this teacup pincushion tutorial is the result! Sadly, it does mean I can no longer drink tea from this cup but at least it means I have an excuse to have it lying around and hopefully to go and buy more vintage teacups? Here’s hoping! It took me about ten minites to make this teacup pincushion, in fact the hardest part was getting both my kids to nap at the same time and get somewhere set up to take some photos! Firstly you need to iron your material. Sorry. Think how annoyed you’ll be though if your pincushion had a big crease on it when you finish it. Use quite a big bit of fabric. I originally guessed how much I would need using some rather fancy Kate Spade material, drew round a saucer, cut it out and it wasn’t big enough. Ouch. So instead I used an old top which not only looked better (no big clashes) but meant that I didn’t mind cutting up more than I needed. It also means I can officially class this as upcycling, go me. Put a wad of toy stuffing in the middle of your material and make it into a ball shape. 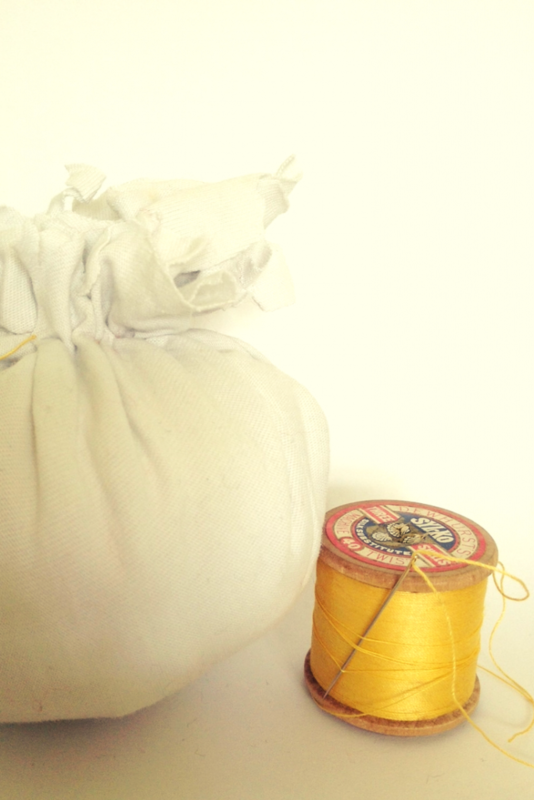 Tie your wool or thread round the end until it is pretty firm, you want it to be able to hold the pins. You could also use a hairband for this to make it easy to adjust. Put your ball into your teacup to check if it fits properly. If it doesn’t have another go. Once you’re happy with it, cut the excess material off the ball and sew round where your wool or thread was to make sure its secure. You can remove the wool now if you want. 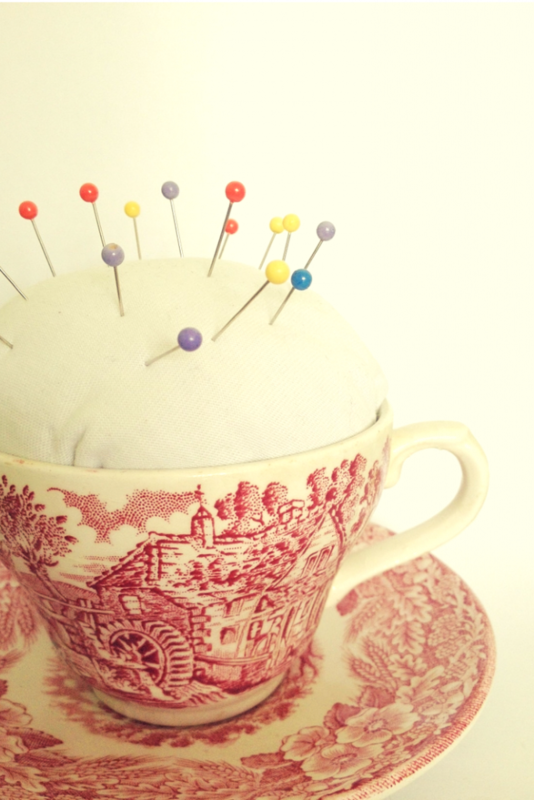 Put some superglue all round the edge of your teacup and place the fabric ball in there. Make sure you’ve got it exactly how you want it as you can’t undo this bit!! Ta da!!!! All done. You are now free to go and have a celebratory cup of tea. Well done you! If you like this post please share it (I’d love a pin!) And if you make one yourself do tweet me a picture, it makes my day to see other people’s creations. This is a great idea, I’ve never seen one like this. I am always losing my pins! Me too, worst is when they are in the carpet!! This is beautiful! Your photos make the post. I have absolutely no crafting skill and am not a tea drinker so it’s not something I’d ever have a home for but I could imagine my mum loving it! She loves tea & sewing/needlework/making clothes! I always wished I had the same interests but me and anything crafty just do not mix! What a lovely idea. I now have a bona fide reason to get some tea cups from the charity shop! Hurrah! I seem to have collected quite a lot recently, whoops! That looks simpler to make than I originally thought, I must make my Mum one of these as she loves to sew. I have such a big pile of them at the moment! Quite embarrassing!! This is a lovely idea and very well explained with beautiful photos. It would make an unusual and thoughtful gift for anyone who enjoys sewing and is an easy way of keeping pins to hand in the kitchen. Great post. Oh thank you! I’m really trying hard with my photos at the moment (only rocking an iphone) so comments like that are much appreciated! What a lovely idea, I’m not much of a sewer but it’s a really nice pin cushion. I so miss cups and saucers, my mum would have them all the time. I used to have a few that only came out if the vicar called 🙂 I think I’ll have to scour some charity shops myself now. 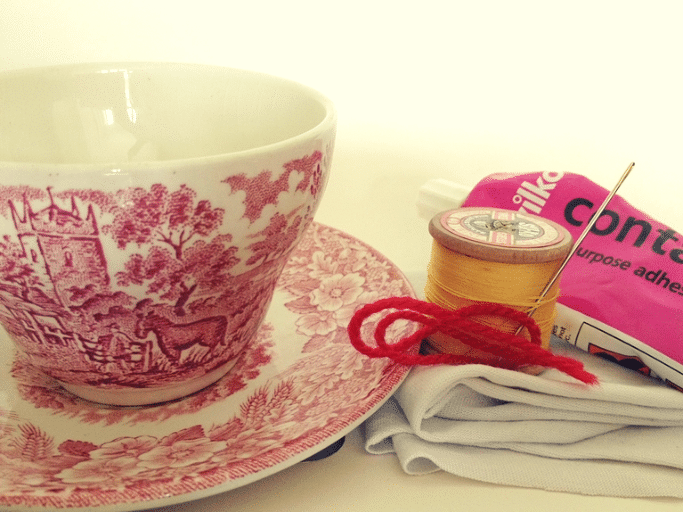 I’ve pinned your tea cup and now I’m off to see what else you can do with a tea cup, thanks for the inspiration. I love makings these and have sold so many of them at craft fairs! Sneaky tip – don’t buy toy stuffing – it’s really expensive – I buy supermarket cheap brand pillows – half the price – twice the stuffing! Totally love this! This is so beautiful! 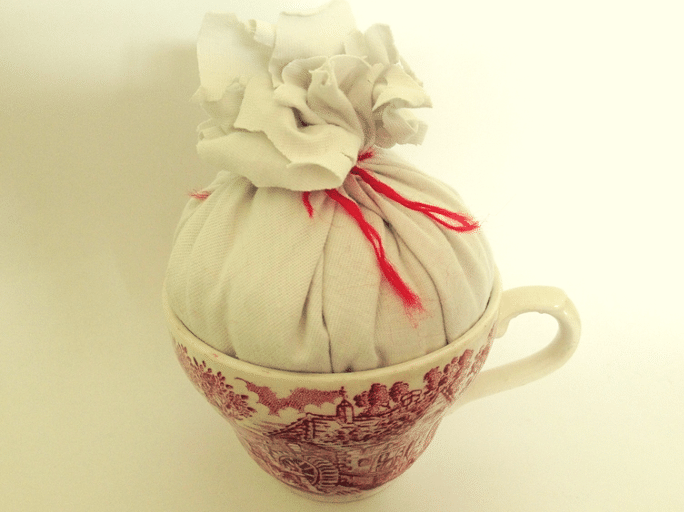 This is a wonderful idea for a favorite tea cup that has a knick or stain inside! Thanks for the inspiration.